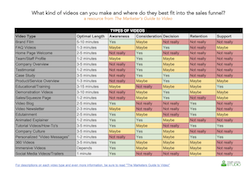 Curious what are the best videos to make for each stage of the sales funnel? Then this document is for you! Plus, get recommended time lengths for each type of video. Enter your email below to download the PDF now! Also, you’ll get access to our Video Resource Center where we provide regular updates on new tech, tools, and tips to make better business videos. Look for a confirmation email with more details!